Designer Maria Montes is a lifelong learner when it comes to lettering and typography. Splitting her time between Barcelona and Melbourne, she works on custom lettering projects, illustrations, and type design, and once a year travels to the remote village of Cabanabona (about 75 miles from Barcelona) to study lettering and calligraphy under the tutelage of Keith and Amanda Adams. There she immerses herself in historic manuscripts, studying lettering techniques from the masters to improve her skills. She shares her knowledge by teaching calligraphy workshops in Melbourne and speaking at design conferences. Not long ago, Montes was invited by designer Carla Hackett and letterpress printer Amy Constable (Saint Gertrude Fine Printing) to design a series of four letterpress cards for the Ladies of Letterpress series Flourish Together. “At the time, I was in the middle of putting together my first solo exhibition in Melbourne, Breaking the Ice,” she remembers. 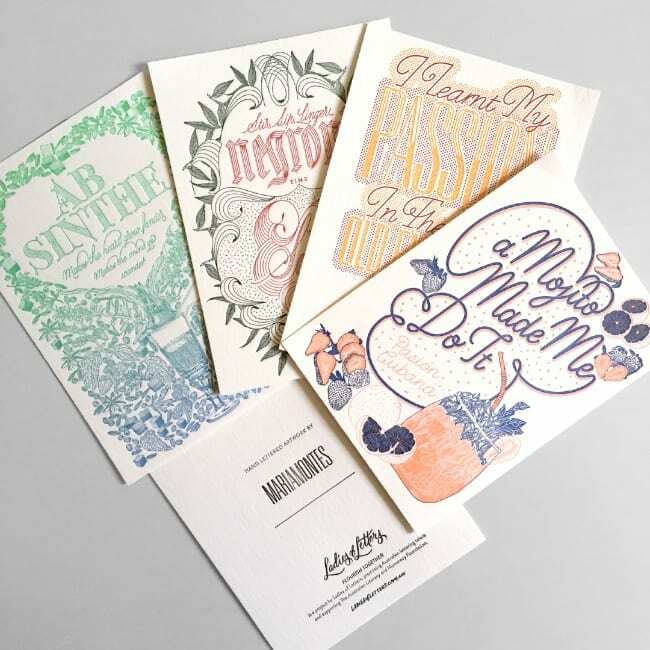 “It consisted of a series of eight full-color illustrated cocktail artworks and pattern prints, so I offered to convert four of my full-color pieces into two-color letterpress cards, and they agreed.” Below, the cards and descriptions Montes created. Read the rest of the interview here.